The other day I received a little e-mail from a special little lady (literally "little" like me)! The e-mail took me back 14 years ago...to the summer after 3rd grade. It may be hard for ya'll to believe that I was obsessed with space even back then, but you better believe it! 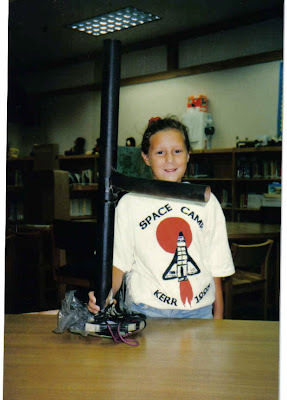 My parents decided to feed the fire by signing me up for a local summer space camp (not the one I later worked at in Huntsville)...and it turned out to be one of the best experiences of my life. Little did I know that I would meet one of my greatest role-models that summer: an unsuspecting teacher with his heart set on igniting students with a passion for math and science...his name was Mr. McMahon. 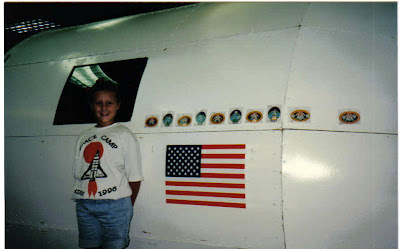 Here I am at "Space Camp" standing by our absolutely awesome state-of-the-art space shuttle, my first astronaut simulation experience...well other than those times I stole my sister's stuffed cats to play "NASA"...haha, oh geez! The summer camp itself was awesome. I learned about space through the mediums of math, science, computers, and music. My already burning desire to become an astronaut exploded into a concrete, tangible, life-long quest. I met friends that I still keep in contact with today, and I learned one of the most important life lessons: that any goal is achievable with enough hard work. And who came to my college graduation party? Mr. McMahon of course!! (And I ran into him at a Doobie Brothers concert...but that's a whole different story!) We have stayed in contact all of these years, along with two very special Boeing retirees Hal and Will (who called me the night of my graduation). I have always felt lucky to have these amazing guys as role models in my life, but that night I felt a sense of accomplishment. And the sense of accomplishment was much more than 4.5 years and a piece of paper...that moment represented a success story...their programs had inspired a little girl to reach for her dreams, and that night she had accomplished the biggest one so far. 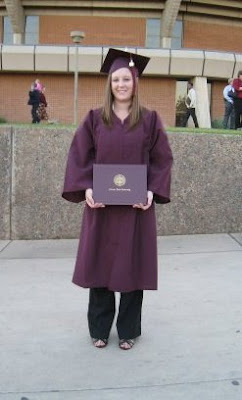 The night Nerdy April truly became a nerd with an Aerospace Engineering degree! So, why did the e-mail from the little lady send me on this wild trail back to 3rd grade, you ask? 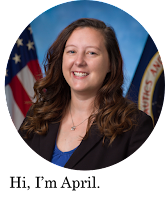 Well, she now runs the "Space Integration Module (SIM...of course it's an acronym...its space!) that Mr. McMahon and others put together. In fact, that summer we got to test out a prototype version with rudimentary computing power and walkie talkies. 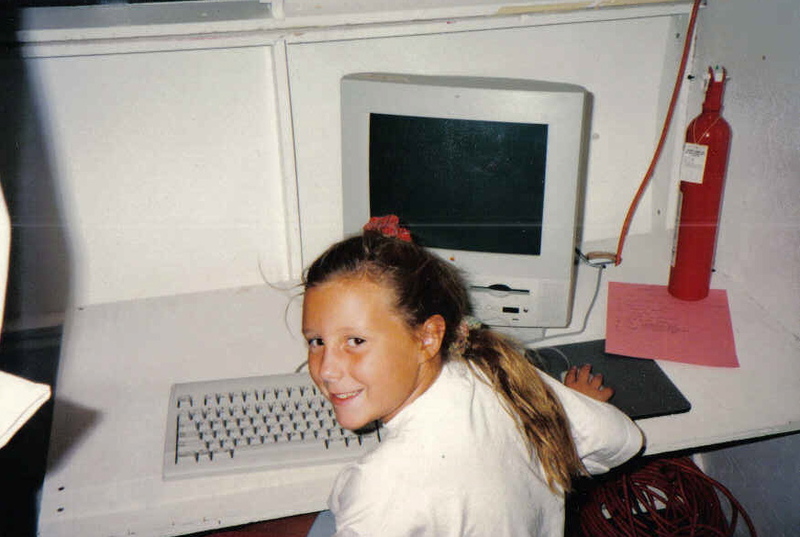 I was really an astronaut, complete with a sweet old-school computer and a 3rd grade do-it-yourself hairstyle. But now the program has flourished into a traveling mini-NASA of sorts complete with state of the art laptops, realistic team building challenges, an orbiter, space station, mission control, and a great teacher, Mrs. Colleen Howard (a.k.a. "the little lady"). While I can't say I know her as well as Mr. McMahon, by nature of history, I know her passion for the program that helped shape who I am today. Last year, as part of my NASA outreach hours I gave a "pre-brief" presentation to prepare some of the kids going through the SIM program for their upcoming mission. The response I saw was incredible! It was so fun to see these kids getting excited about space, and it was fun for me to remember how much I loved space even back in the 6th grade. My dream, as I am sure is shared by many associated with this program, is for these young minds to become engaged in the space program; to show them that they can do anything they set their minds to; that we NEED them to help continue our manned spaceflight programs in whatever capacity they are interested in. One of my first engineering challenges! Thank you, Colleen, Don, Hal, Will, and the countless others who inspired me on my path to becoming an Aerospace Engineer. And I am continuing on my quest to become the first diabetic in space: last week I received a letter of congratulations for my acceptance into Embry-Riddle Aeronautical University's Masters in Aeronautical Science degree program!! I am so excited to continue this journey, and I owe so much of what I have accomplished to all of you!! More information about the Space Integration Module can be found here! What a tribute to a program that is growing and inspiring others to learn, learn, learn! And you, little lady, are truly a gem! On your way to the Space Program, you were the first 6 th Grade Test Pilot for the BOEING DS46 Fixed Wing Flight Simulator. And you continued to support the Mesa Public School's Flight Centers on going programs for 10 years, inspiring over 50,000 plus kids. That success led to the Space Integration Module being developed, building on the existing Colleen Howard Space Shuttle concept. Oh, how I remember that nerdy little girl who absolutely loved space. What I remember most is how you never turned away from a challenge. You thrived on them. You won me over from the first day. I think you did three or four years of space camp. It was because of you that we kept it going so long. I don't think you knew that. You were hungry for more so we had to keep going. Now look where it's gotten you. I want to thank you for being so supportive of all our projects over the years. Because of you, either directly or indirectly, nearly 10,000 kids experience flight (at the two flight centers) and space through the SIM project that Colleen has taken over. Thanks for being our aeronautical/astronautical poster child for all those years. And most of all, thanks for being a friend still. Take care and settle for nothing less than the best. We may still call on you to let everyone know how much all this impacted you. I'm afraid your a lifer, we're still workin' it.